Yum, like a small bit of apple pie heaven! These muffins are moist and tender, with a delicious apple-spice flavor. The pieces of apple are chock throughout and provide the apple pie experience even more. I omitted the walnuts from the "crunch" topping and filling...because I don't like walnuts, or any nuts, in my baked goods. Still, the flour-cinnamon-sugar-butter mixture held up and added a nice buttery flavor. These would be amazing fresh from the oven. But two days later, I'm still eating them and they still taste great. My one gripe: these could have used a little salt. What's with these Taste of Home recipes and salt? 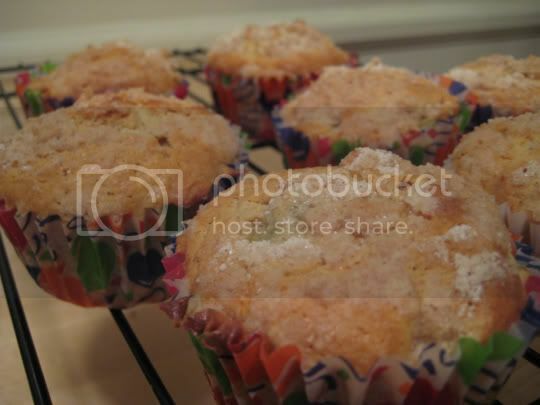 Too much in the Lemon Poppy Seed Muffins, too little in these. My rule of thumb is usually if a recipe includes actual salt, then I use unsalted butter. That didn't seem to work here. Oh well. Make again? Yes, with salted butter next time.